This past December, our family moved into a little villa in our country of service. After 19 years in apartments, my heart still warms when we drive up to our little house. My own front door? My own yard to rake? My own fruit trees to pick? It's a blessing I don't take for granted! My kids and I decided our little yard would make the perfect backdrop for a fall display, as our leaves were turning shades of yellow and orange and falling lightly upon the now browning grass. We drove past a trash heap and spotted an old wooden chair. It only needed a bit of trimming to get the vestiges of fabric off. Additionally, we found a couple of vegetable crates behind our grocery store and snagged them before they made it into a bonfire. Turning them upside down and stacking them made the perfect little table for a few extra fall-themed decorations. 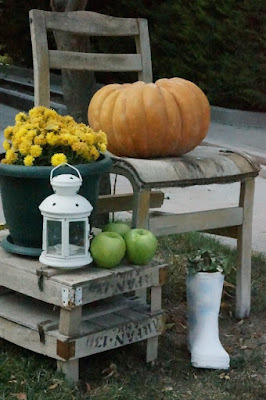 And apple from our tree, a lantern from the house, a big orange pumpkin, and a pot of mums added a cozy look. The final touch was an old boot my now-6th-grader had outgrown. A little hearty plant growing out of the top provided the whimsy we needed. And in reality, other than buying the mum and letting it take off and purchasing a big pumpkin, we paid nothing for our display. But we hope it said to all who drive by, this home warmly welcomes you.